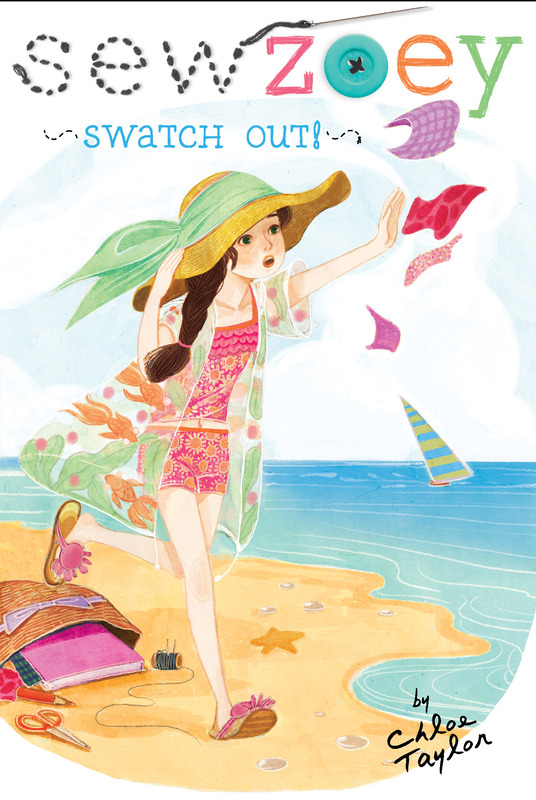 As the summer ends, Zoey thinks something’s fishy—so she’s making waves! Includes “Sew Zoey” blog posts and fashion illustrations. You have NO idea how excited I am to be blogging again! After six weeks away at camp, being able to just pick up my laptop and blog whenever I want to feels AMAZING! School’s starting pretty soon, but there’s enough summer left for a few small adventures, right? And even though my top priority is to be a good friend to one of my besties who really needs me at the moment, I’ve also got a mystery to solve. A fashion mystery. That’s right! I think I’ve figured out the identity of my longtime “mysterious benefactor,” Fashionsista. I’m still not sure how I feel about finding out for SURE who she is. After all, there’s something pretty awesome about having a secret friend who sends you amazing gifts! But I think it’s time. So, Fashionsista, if you’re reading this, check your mailbox for a letter from me. I’ll be mailing it to you just as soon as I get the courage to put it in the mailbox. . . . At least, I think it’ll be to you! And in honor of the potential unmasking of my secret friend, I’ve posted a sketch of a masquerade outfit. . . . Isn’t it dramatic? Probably too much for the first day of school, though, right? Zoey Webber was having a blast. It had been way too long since she’d spent a lazy afternoon at the community pool with friends, and she’d even been lucky enough to get a ride there from her older brother, Marcus, who was working as a lifeguard for the summer. Zoey and her friends Priti Holbrooke and Libby Flynn had found three lounge chairs near the diving well, and they were stretched out chatting. Libby was filling Priti and Zoey in on the details of her ballet camp after Priti and Zoey shared stories from their six weeks at sleepaway camp. The only thing that could have made the afternoon better was if their other friend, Kate Mackey, could have been there too. But she was at preseason swim camp for another week. Priti and Libby both swiveled their eyes toward Marcus, who was perched on the lifeguard stand by the lap lanes. He wore sunglasses and a visor, and he appeared to be watching some young kids in the shallow end. At the word “family,” Zoey noticed a shadow cross Priti’s face. Priti’s parents had just recently decided to divorce, and Zoey knew how hard Priti was taking it. “You okay, Priti?” Zoey asked. Priti was normally the life of any party, louder and more cheerful and zanier than anyone else. But since she’d gotten the news from her parents, she’d been subdued. Priti nodded, but her shoulders wiggled up and down too, so it was more of a shrug than a nod, and seemed to mean, Sorta, but not really. Priti was sitting in the middle of the three girls, and without a word, Libby and Zoey leaned toward her and squashed her with a hug. It was a Priti sandwich, and after a few seconds, Priti had to burst out laughing. “You mean Sophie?” Zoey cocked her head, curiously. Sophie was little, only about six years old, and the girls hardly ever saw her. With the age difference, and Sophie still being in elementary school, their schedules just didn’t intersect. Zoey wanted to chime in too, but Marcus didn’t really drive Zoey bonkers. He was a pretty great brother, actually. Although he had been pretty dopey for putting her pool bag back up in her room. But since he’d also given her a ride, and had been nice enough to agree to take her to meet Kate later, she decided it was a draw. He was still a good brother. She and Libby clutched hands and then squealed. Several people sitting nearby turned to stare at them, and Zoey blushed. She hadn’t meant to sound like the crazy tween fan of a gorgeous teen heartthrob, but that’s exactly what she was. Cody Calloway was gorgeous and had an awesome new album out, and best of all, Libby’s mom was taking her, Libby, and Sophie to his concert. Zoey would actually be in the same venue as Cody. She desperately needed the right outfit! Priti always said that, so Zoey took it in stride. She’d let Priti have her opinion, even though it was wrong—Cody was the best-looking boy on the planet. Zoey had even put a picture of him on the back of her bedroom door, so she could see him whenever her door was closed. The girls enjoyed the sunshine and talked awhile more, until Marcus’s shift was over and he came to collect Zoey. Libby and Priti planned to stay until Libby’s mother came to get them after work. Priti very nicely loaned Zoey a long T-shirt to wear to the ice cream parlor, so she wouldn’t have to go in just her bathing suit. It wasn’t exactly the outfit Zoey would have chosen, but at least it wasn’t a Joey Joseph-Brown T-shirt. That would make her feel like a traitor. The teasing continued until they arrived at the parlor, and Zoey saw her oldest friend in the world, Kate Mackey, waiting for her. Kate was fresh from swim camp and looked as damp and messy as Zoey. The girls hugged and then went straight to the counter to order. Mrs. Simms, the owner, happened to be wearing the cloth headband, in the store’s colors, that Zoey had made for her several months before. It always gave Zoey a thrill to see someone wearing one of her designs. It made her feel like she was really on her way to being a top designer one day. Allie came through the doorway a few minutes later and zoomed toward Marcus. After they’d said hello, she came over to Zoey and Kate, who’d already ordered. There weren’t any tables for four available in the ice cream parlor, so Kate and Zoey grabbed a high table for two by the windows, and Allie and Marcus sat in the back. Once they were seated, Kate and Zoey couldn’t help sneaking peeks at Allie and Marcus sitting close together, their heads nearly touching as they shared a hot fudge sundae. Zoey nearly dropped her own cone. Not that it was such a surprise—after all, Kate was an amazing swimmer and always did her best to support her teammates—but it was surprising that Kate hadn’t told her the moment they’d arrived. The girls giggled and clinked their cones together. Some praline delight glommed on to Zoey’s triple fudge, but she didn’t mind. Zoey shook her head woefully and then bit off a huge mouthful of ice cream. Zoey listened, nodding her head slightly. Kate made sense. Zoey knew the reason she’d been somewhat successful so far as a designer was because she kept doing. She created her blog, and made outfits for friends, and ran her Myfundmaker campaign for Doggie Duds, and started her Etsy store. And she didn’t know in advance how any of those ventures would have turned out—she just went for it. So maybe the same was true with Fashionsista’s identity. She just needed to go for it. Only—and this was where Zoey had to listen to the voice deep down in her belly—what if she didn’t want to let the mystery go yet? What if the reason she was dragging her feet was to eke out every last bit of suspense? Kate laughed, blushing slightly at being called a team captain. Then, suddenly, Zoey remembered the other thing she wanted to discuss with Kate: Priti. “Me neither,” Kate said, licking a drop of ice cream that was pooling on the rim of her cone. Kate’s parents were high school sweethearts, and still very happy together, and Zoey’s mother had passed away so long ago that to Zoey, having one parent around the house was totally, 100 percent normal. Relieved they’d come up with a plan to help their friend, the girls concentrated on finishing their ice cream. Both girls laughed until they couldn’t laugh anymore. Book Cover Image (jpg): Swatch Out!